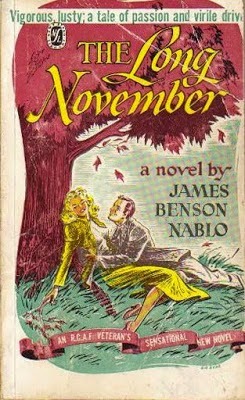 The first of five sent by Welland bookseller Steven Temple, this photo of James Benson Nablo's The Long November has had me pouring over old notes. Four years ago, my nose was to the ground in dogged pursuit of the figures behind its publisher, Double Flame of Hollywood, California. I enlisted help in the hunt from my man in L.A., Stephen J. Gertz. We got so far as to amass a list of suspects, but then I got hungry and was forced to return nose to grindstone. Canadian writers should be ever mindful of the fate of John Richardson. 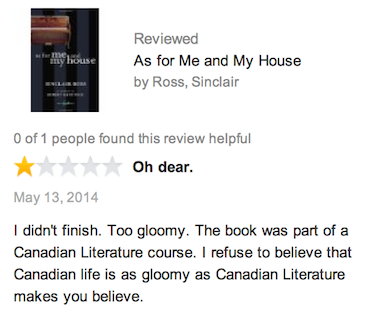 What's someone so focussed with things Canadian care about a Tinseltown publisher, anyway? 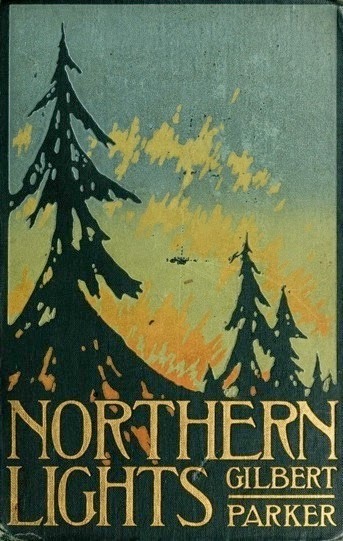 Double Flame issued just three books – The Long November, Port of Call by Stephen Mark, and Serge C. Wolsey's Call House Madam – each of which had appeared six or seven years earlier as News Stand Library paperbacks. There's got to be a link between the two fly-by-night publishers, right? The Long November is by far the best of the three titles, but it's Port of Call that holds my interest. 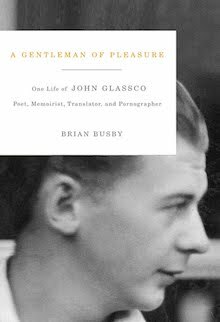 It first appeared – more or less – as Overnight Escapade, one of the strangest books I've read this year. 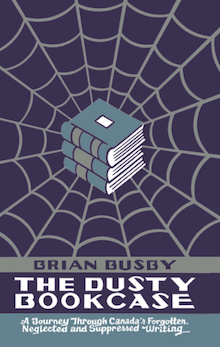 It's not a novel, but a very long short story packaged with some very short short stories and others of a conventional length. Port of Call and Other Selected Stories on the title page, the Double Flame edition not only renames the lead, but drops a couple of others. It's easy to see why Double Flame was so attracted to the Nablo and Wolsey titles. 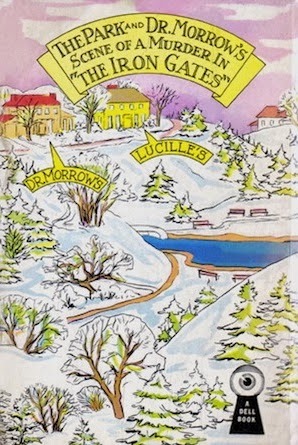 First published by Dutton in 1946, The Long November enjoyed three hardcover printings and numerous mass market editions (and is back in print with a new Introduction by yours truly). Call House Madam, purportedly the story of the career of L.A. brothel keeper Beverly Davis, enjoyed even greater sales with all sorts of editions stretching from the very early 'forties to the very late 'sixties. 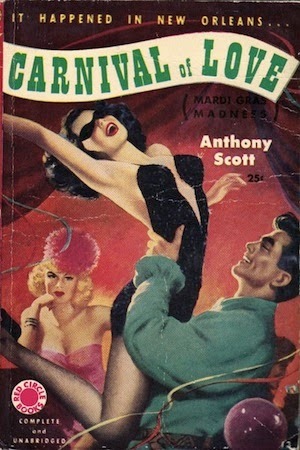 "Over 400,000 copies sold at $3.95 " claims the 1963 Popular Library paperback. 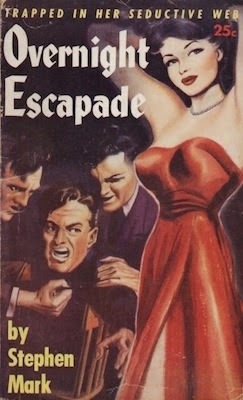 But why Overnight Escapade? 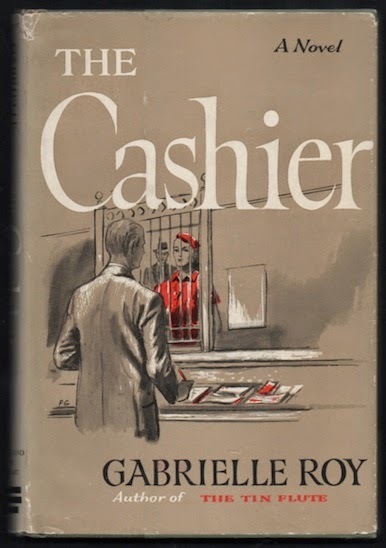 The book came and went in April 1950; unlike many of its titles, News Stand Library never even bothered issuing an American edition. The 1957 Double Flame repackaging is the second and last we've seen of Stephen Mark and his strange stories. Looking over these photos has me itching to reopen the Double Flame file. But now, it's time for lunch. Gotta eat, you know. Note: My thanks to Steven Temple for the photographs. Those interested in purchasing the Nablo and Mark Double Flames are encouraged to contact the bookseller through his website. Well, they were big names back then. And G.K. Chesterton lives on, right? 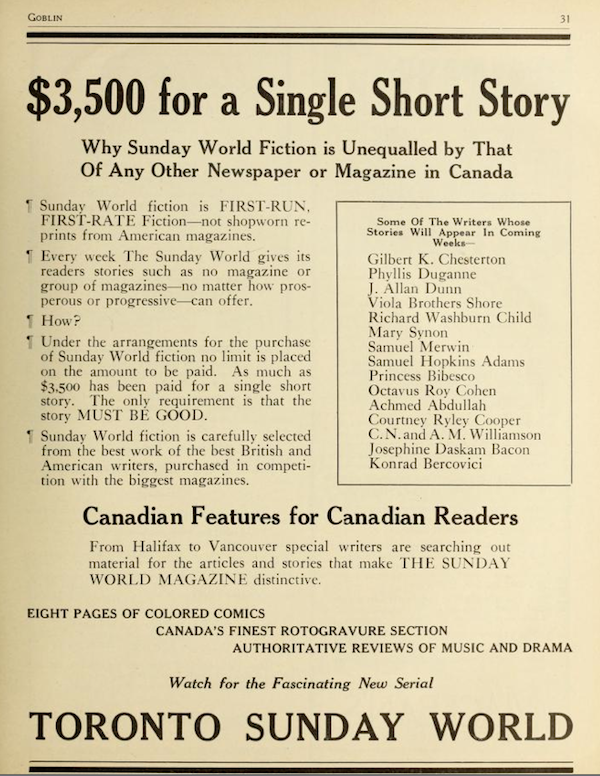 Here's the thing: Canadian short story writers – "special" or otherwise – had little place in the magazine. 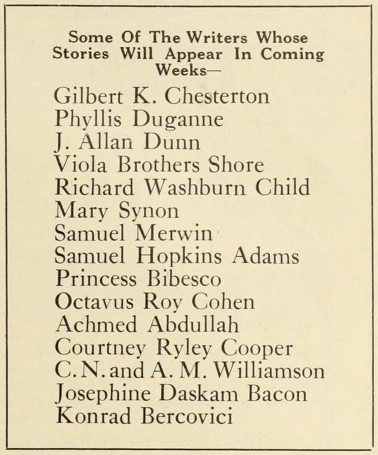 Rudyard Kipling, E. Phillips Oppenheim and Mary Robert Rinehart featured, but not Arthur Stringer, Frank L. Packard or Isabel Ecclestone Mackay. The sole Canadian I've found is Sir Gilbert Parker, and he hardly needed the money. 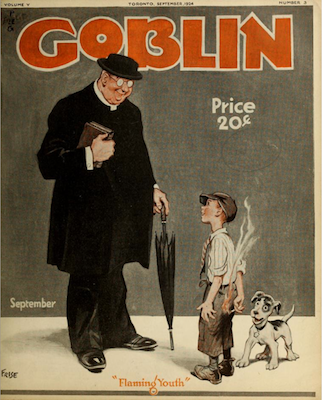 The Sunday World published its last issue in November 1924, just two months after that Goblin ad. Maybe they were paying too much for those stories. The Bank of Canada informs that $3500 in 1924 is the equivalent of $48,883.33 today. 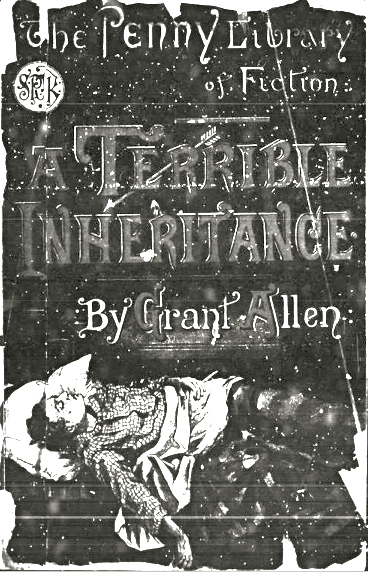 A Terrible Inheritance is by far the worst Grant Allen I've read to date. 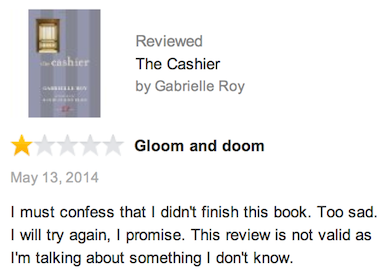 That it's so short made it no easier task; in fact, much of what makes the book so very bad is caused by its brevity. Subplot and character development have no space. The twists and turns found in Allen's best are all but absent – there's precious little room to manoeuvre. 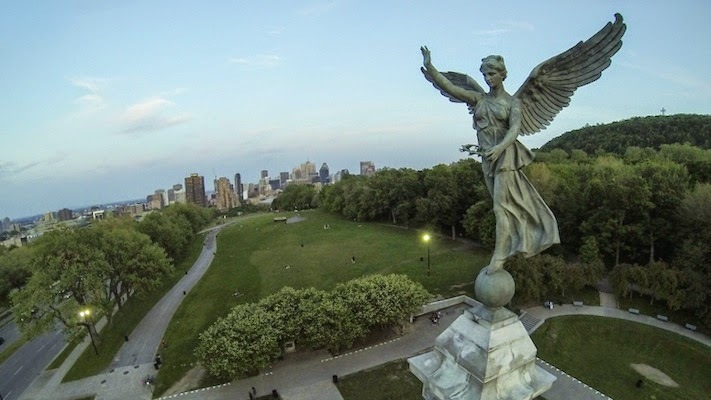 Coincidence, ever-present in the man's work, is forced to even more absurd heights. I blame the Society for Promoting Christian Knowledge, which in 1887 commissioned and published A Terrible Inheritance as part of its Penny Library of Fiction. 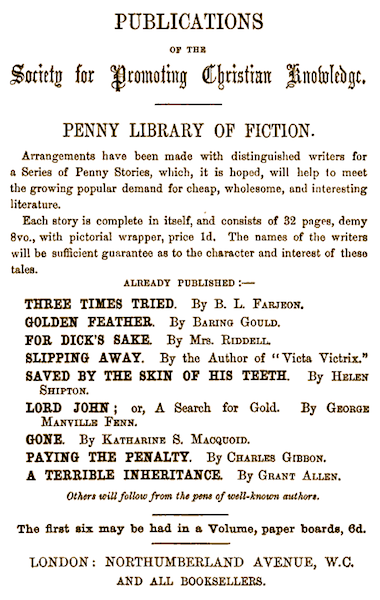 The Society was strict about its Penny Library of Fiction, ensuring that each volume numbered thirty-two double-columned pages. An old pro – he would've been thirty-eight at the time – Allen wrote to measure. Biographer Peter Morton tells us "Allen was able to manufacture featherweight novelettes like these in a few hours, surely without engaging his higher mental processes at all." 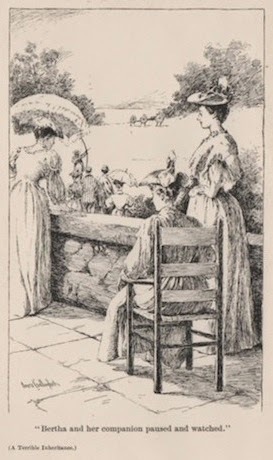 A Terrible Inheritance begins with the actions of an idiot, spoiling an otherwise very pleasant garden party at the English country home of Sir Arthur Woolryche. Here are the details: Some upper class twit, a would-be archer seeking to impress, strolls out onto the lawn, draws his bow, and hits the family dog. The tragedy is made all the worse with the discovery that the arrow, one of Sir Arthur's Guyanese curios, has a poisoned tip. "Mr. Prior's here," somebody answered in haste from the group. "He knows more about poisons and poisoning than almost any other man in all England. He's made a special study of it, as I know. Mr. Prior! Mr. Prior! Come here, you're wanted." Good luck soon comes to outweigh the bad. 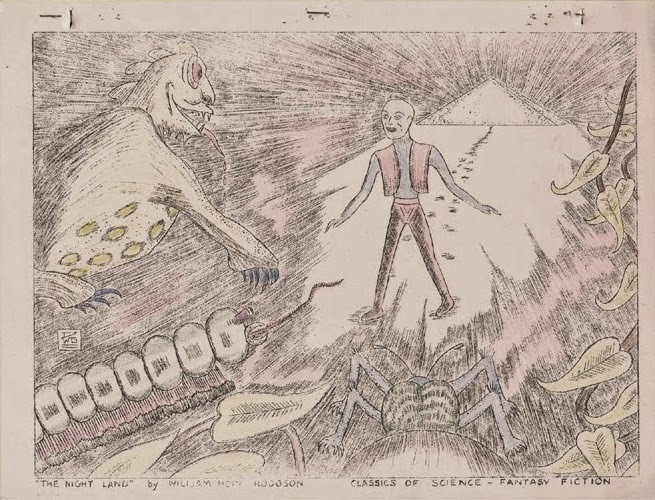 Prior is not only an expert in poisons, but is the leading authority on curari, the very one used on the arrow. What's more, just days earlier he had received from South America an elixir that may well prove to be an antidote. Prior saves the dog, thus proving the corrective effective. The College of Physicians' awards him its gold medal. 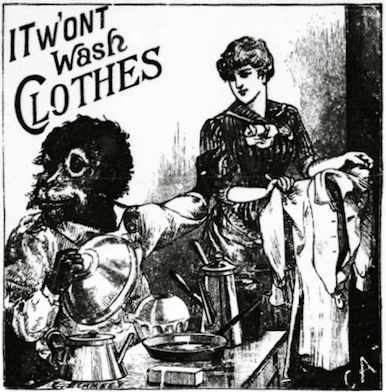 Better still, Bertha, Sir Arthur's beautiful daughter, falls for his "manliness and sterling good quality". Father gives his blessing, despite being troubled by the young man's resemblance to… to… Sadly, Sir Arthur can't quite place the face. Remember, this is the tale of a terrible inheritance, not a happy union. As the wedding day approaches Prior learns that he is the son of a Dr Walter Lichfield, also an expert in curari, who had died in disgrace whilst awaiting trial in the poisoning death of an uncle. London: E. & J.B. Young, n.d.
"I don't know whether my profession makes me think to much of hereditary transmission, and all that sort of thing; but if I were born with a curse like that hanging over me, I'd give up my life entirely to some good for my fellow-men, and expose me least of all to any possible temptation. And I'd never marry." Prior's only hope is that the man he now knows to have been his father was in fact innocent. 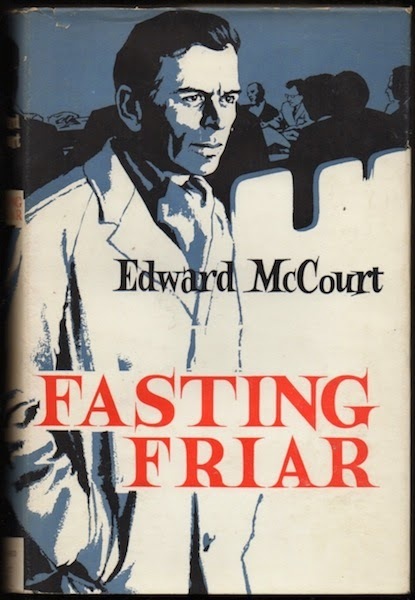 Through his investigations, he comes to believe that Arthur Flamstead, Lichfield's close friend, was the actual murderer. Who is Arthur Flamstead? Why none other than Sir Arthur himself. "He assumed the name Woolrych instead, by royal warrant, on the death of a distant cousin on his mother's side, from whom he inherited a certain amount of property," explains Lady Woolrych. Sir Arthur? A murderer? I didn't believe it for a second, in part because his daughter Bertha is such a sweet girl. 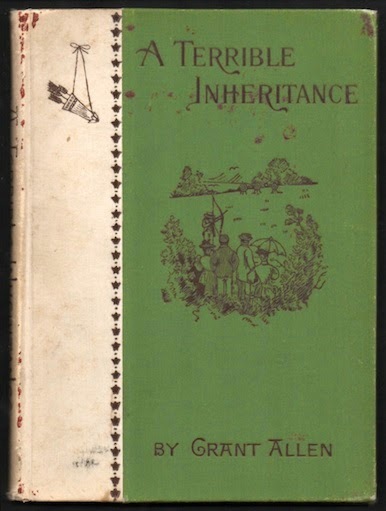 A Terrible Inheritance plays upon Allen's pet theories regarding heredity, something he does to greater effect in What's Bred in the Bone, The Devil's Die and A Splendid Sin. This adds a certain of predictability – a drunkard's offspring will become drunkards, a gambler's offspring will become gamblers, and an expert in curari will spawn experts in curari. Those familiar with Allen will look about the small cast of characters for the true murderer, but find none. Sure enough, the true culprit is introduced in the final chapter. Do I spoil things more by revealing it all ends with a wedding? Trivia (for Canadians): Prior doesn't know he is the son of Lichfield because he was an infant at the time of his father's death. His mother soon set sail for Canada, where she and her children lived "under an assumed name in a remote village". 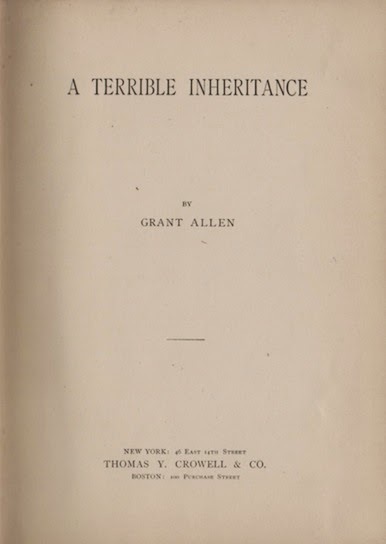 Trivia (for writers): A Terrible Inheritance was the first of three books Allen wrote for the Penny Library of Fiction; A Living Apparition (1889) and The Sole Trustee (1890) followed. 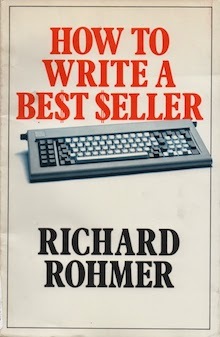 Writers for the series earned between 30s and £10 per title – roughly £172 and £1150 today. I'm guessing that Allen's pay was at the upper end. Either way, it's not bad for an afternoon's work. 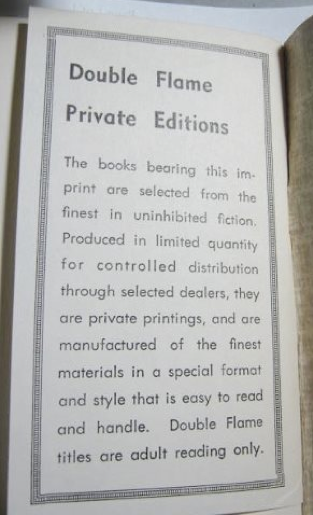 Object: A slim, 57-page hardcover, my copy, the first American edition, was purchased in August from a Yankee bookseller. 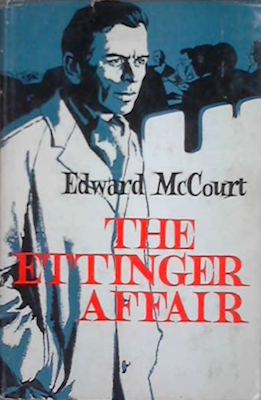 The frontispiece, by an illustrator named Gallagher, has been simplified somewhat on the cover. Am I wrong in thinking it a novella? Is it a long short story? The word count is 16,226. You decide. 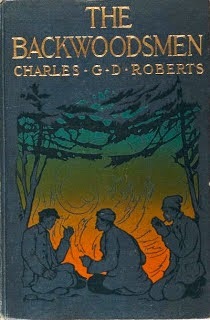 Access: A Terrible Inheritance enjoyed three editions and was later published in Danish (En underlig arv, 1891), Swedish (Mordet i Erith, 1917) and German (Ein schreckliches Erbteil, n.d.). The Kingston-Frontinac and Toronto public libraries have copies, as do the University of New Brunswick, University of Alberta and Simon Fraser University. Last century, the Canadian Institute for Historical Microreproductions produced microforms of the Crowell and Young editions. Both can be read gratis at the Internet Archive. As might be expected, they have attracted a wake of print on demand vultures, who in turn excrete all kinds of mess. Miami's Book on Demand demands US$55.78 for theirs; just under a dollar a page. 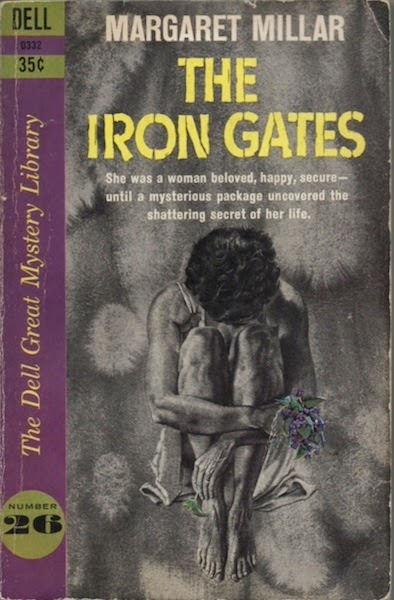 It's been well over six years since Patti Abbott launched Friday's Forgotten Books, a weekly round-up of blog posts dealing with buried, obliterated and blown over titles from years past. A latecomer, I first contributed back in December 2011 with Touchable, a novel co-authored by the man who created Bizarro World. 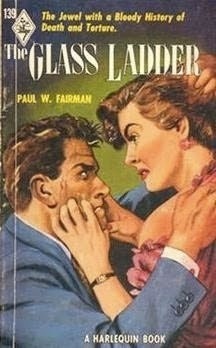 Anyone interested in the obscure will find Friday's Forgotten Books a weekly treat. Last Friday's gathering included neglected gems like Dolores Hitchins' Sleep with Slander and The Deadly Climate by Ursula Curtiss. Most of Patti's contributors are Americans, and much of the focus is on the American and British, but that doesn't mean there's nothing for the lover of Canadian literature. Patti herself is a great champion of Margaret Millar, as am I, as is John Norris of Pretty Sinister Books. Though we've never met in person, I think John might agree with me that Martin Brett's Hot Freeze is the great Canadian noir novel. 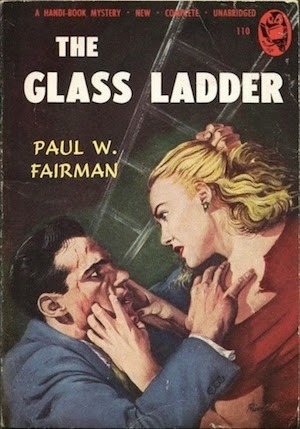 At the very least, he shares my opinion regarding Frank L. Packard's influence in crime fiction. 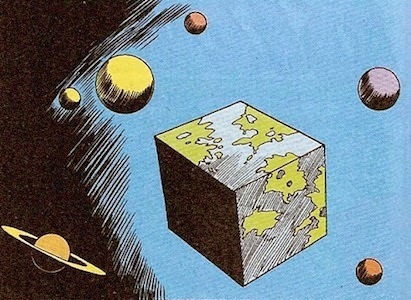 I would be doing something of a disservice in not sharing this image from John's post on Canadian Fandom #17. 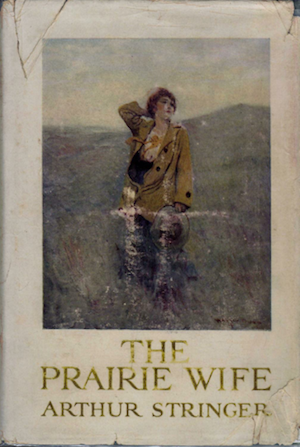 It may well be the ugliest thing published in 1951, and here I'm including Taylor Caldwell's The Balance Wheel. 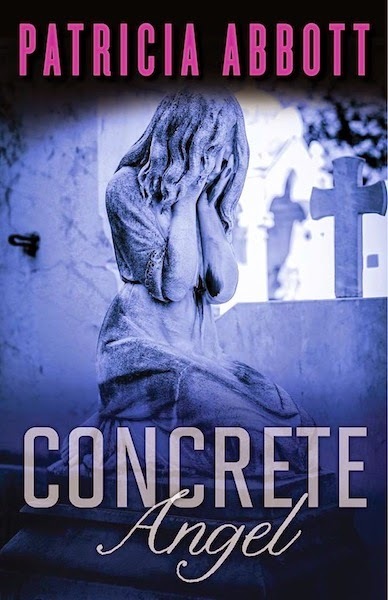 Returning to Patti, this week saw the announcement of her debut novel, Concrete Angel. 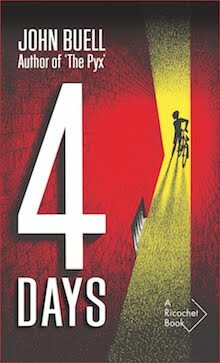 Publisher Polis Books describes it as an "unflinching novel about love, lust and greed". Who can resist? Not me. I'll be picking up a copy. 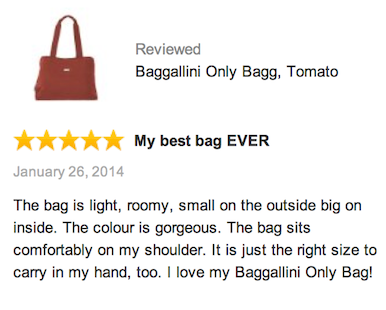 Three reviews by Amazon customer Lamppu. I have problems with the first, disagree wholeheartedly with the second, and have no opinion on the third. Such a young country. 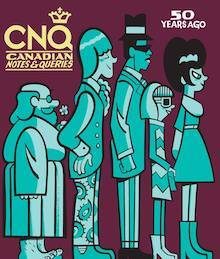 I'm still kind of a kid – really – and yet I remember Canada's centennial celebrations. 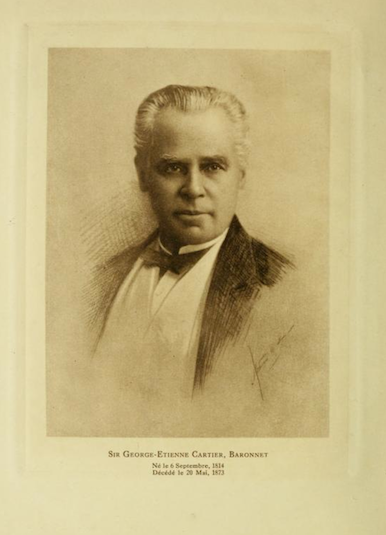 So, it makes no sense – not really – that today, 6 September 1919, should mark the 200th birthday of George-Étienne Cartier. Yet it does. 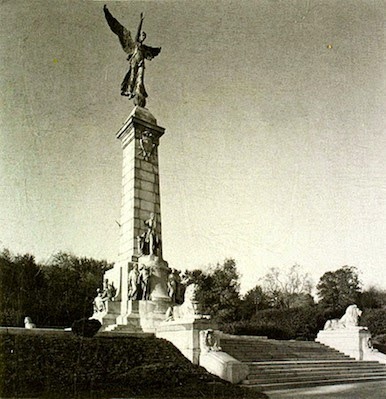 A son of Saint-Antoine-sur-Richelieu, one hundred years after his birth, one hundred years ago today, saw the dedication of the most glorious monument in the Dominion. 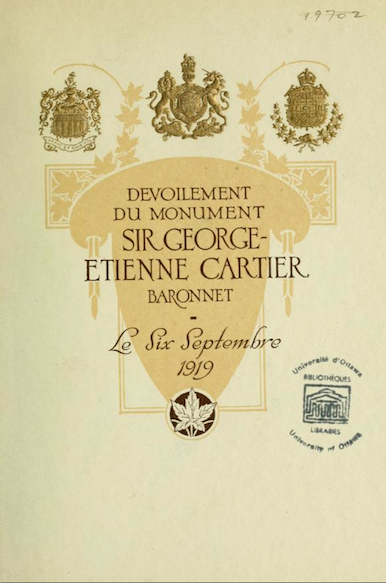 The program for the unveiling, a two-hour affair, includes Benjamin Sulte's "La Statue de Cartier" and "The Statue of Cartier" by Gustavus William Wicksteed, both dating back to the 1885 installation of the statue on Parliament Hill. 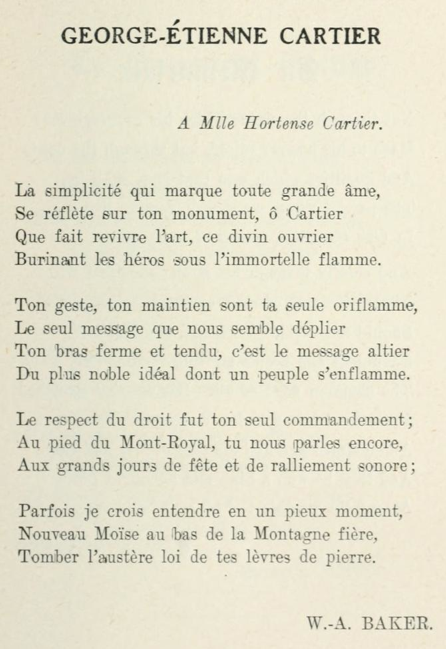 I think William-Athanse Baker's tribute to Cartier would've been more appropriate. Two hours. Imagine. Charles Joseph Doherty, Robert Borden's Minister of Justice spoke. What can we expect today from Peter Mackay? 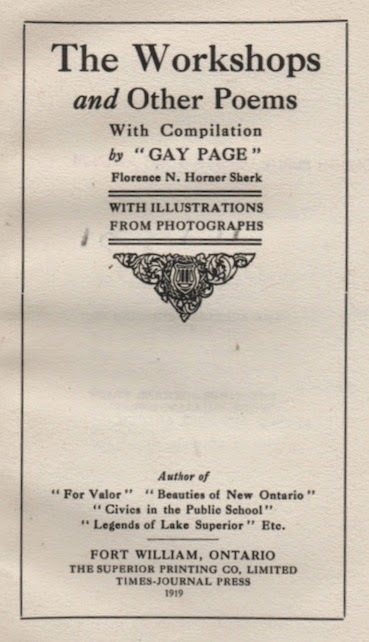 Labour Day Verse for "All Good Workers"
The dedication in The Workshops and Other Poems, the only volume of verse by Florence Nightingale Horner Sherk (1857-1930), otherwise known as "Gay Page". 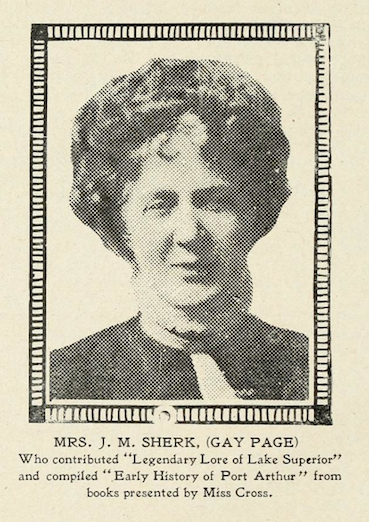 James Hardy Sherk (1887-1975), a lawyer, was the poet's only surviving child. Happy Labour Day, Young Fella!